Roasted Japanese sweet potatoes served with sun-dried tomato Romesco, makes for a deliciously quick and easy appetizer or snack. So I’ve had sweet potatoes on the brain all week, specifically these little sweet potato bites. 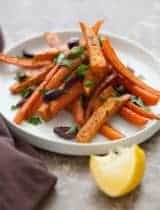 They’re roasted until crisp on the outside and creamy on the inside and served with a spicy side of sun-dried tomato Romesco sauce. 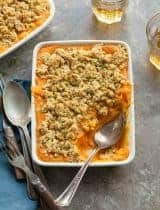 Maybe it’s the weather, maybe it’s the season, whatever the reason, I’ve been finding myself craving sweet potatoes lately. 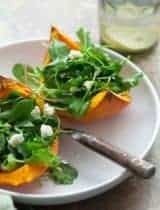 You certainly can’t beat how versatile they are (a sweet potato is good pretty much any time of day, and prepared in an infinite number of ways). These sweet potatoes are Japanese sweet potatoes (also known as Asian yams) and they’re a little different from your usual orange variety. Starchier and less sweet, they have a light purple skin and a creamy white interior, they also roast up terrifically. Briefly boiling the potatoes before roasting them creates a crisp golden exterior while the interiors stay creamy and tender. 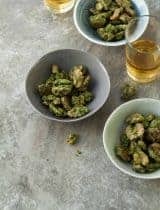 And while they’re delicious simply roasted with a drizzle of olive oil and a pinch of salt, they’re even better served with a bit of Romesco on the side as an appetizer. Romesco is one of my favorite sauces. 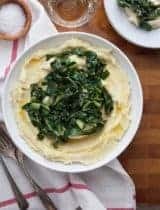 It’s an all-purpose, all-season sauce that you can make to suit your tastes and with what’s in your pantry. (Round up some olive oil, garlic, nuts, a jar of roasted red peppers, a few spices and you’re all set.) Not only is it quick and easy to whip up but you can eat it with just about anything. I like to add a few sun-dried tomatoes to mine for extra depth of flavor, which along with the roasted red peppers gives it a beautiful rusty red color. It also gets a generous kick of heat and smoky flavor from cayenne pepper and paprika. 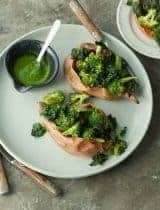 The best part about it, is that the flavor actually improves with a day or two in the fridge so you can make the sauce ahead of time and only roast up the potatoes when you are ready to serve. Hot from the oven, the slightly sweet and creamy potato bites are the perfect counter point to the spicy, smoky dip. in a large saucepan, cover the cut potatoes with generously salted water and bring to a boil. Lower heat, and simmer for 5 minutes. Drain, return potatoes to empty saucepan and let the steam evaporate for a few minutes. Transfer the potatoes to baking sheet. 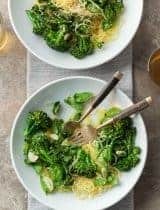 Drizzle with olive oil and salt, Toss gently to coat. Place in oven and roast for 20 minutes or until crisp and golden on the outside and tender when pierced with a knife. 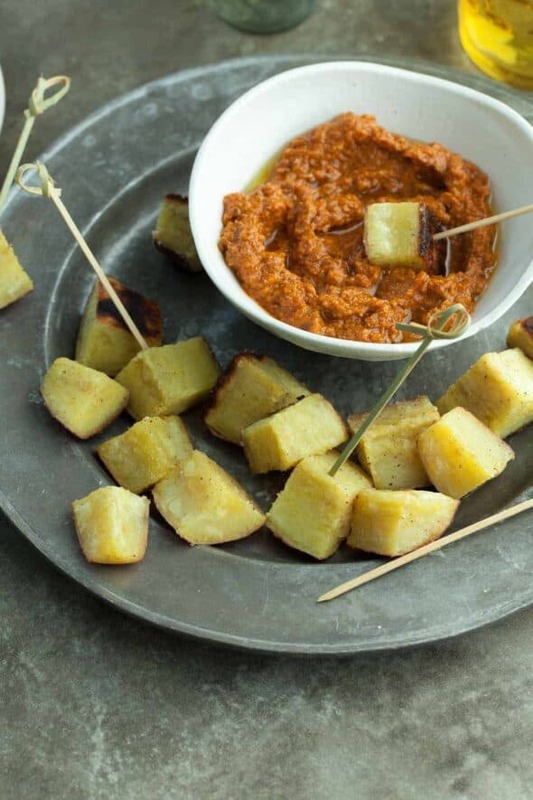 While the potatoes are roasting in the oven, make the Romesco sauce. Place sun-dried tomatoes, red peppers, almonds, garlic, cayenne, paprika, salt and olive oil in the bowl of a small food. Pulse just until combined but still textured, adding extra olive oil as necessary to loosen sauce. If not using right away, transfer to an airtight container and store in refrigerator. 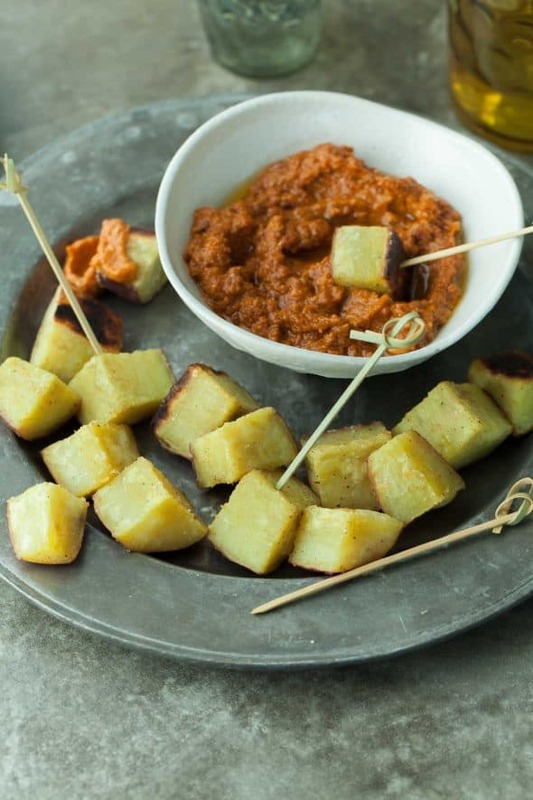 Serve potatoes warm from the oven, with Romesco sauce on the side. 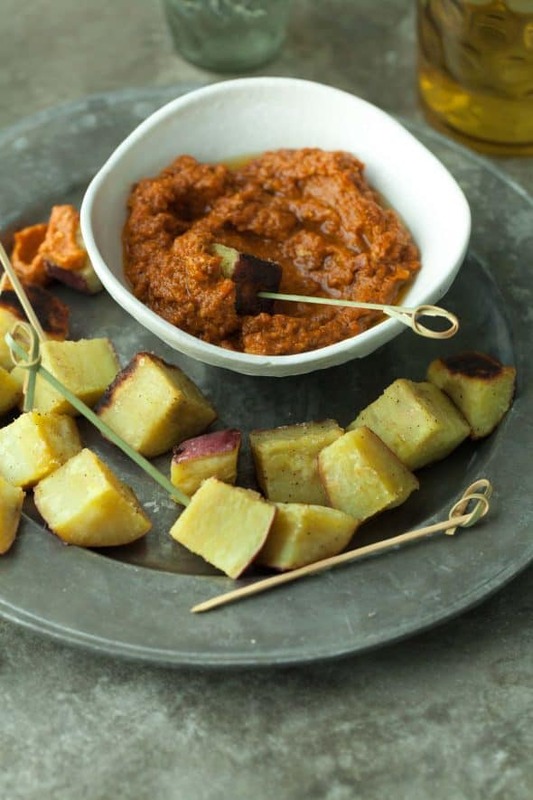 Wow, love this Paleo romesco! And big yum to the sweet potatoes, and using them as an appetizer, so clever. Great tips for getting these sweet potatoes just right. 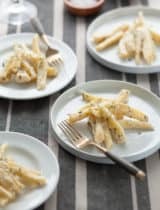 My kids love anything they can eat with a toothpick, and I love how healthy and simple these are! Thanks for sharing!